Thanksgiving is almost here people. And that fact alone calls for a celebration. There’s going to be a long weekend, and it’s also going to mark the one year anniversary of Tsawwassen Mills. And that means that from Saturday, October 7 to Monday, October 9 you’ll be able to enjoy a ton of cool happenings at the mall. This includes everything from massive discounts at more than 60 stores, complimentary cupcakes (while supplies last), balloons, and more at BC’s premiere shopping destination. Since there are 180 brands at the mall, you’re sure to find the key essentials for your winter wardrobe like boots, wooly hats, coats, scarves, and more. So to help you see why visiting Tsawwassen Mills this Thanksgiving long weekend is a great idea, we’ve rounded up the top five things you can enjoy while you’re there. Get ahead with the latest fashion trends by visiting Tsawwassen Mills and taking advantage of their long weekend savings booklet. This includes amazing deals like $25 off a minimum purchase of $150 at Saks OFF 5TH, save 20% off purchases of $75 or more at the Aldo Outlet, get 15% off your entire purchase at The Outlet by Harry Rosen, and much more. Simply visit guest services near entry three or at any of the entrances to the mall to pick up your booklet or download the e-edition here. Even though it’s actually Tsawwassen Mills’ first anniversary, you’ll get to receive the gifts. Yep, this means you’ll get to take part in a wide range of free family activities and receive complimentary cupcakes from 1 to 5 pm. But remember that they’re limited so be sure to get there early. 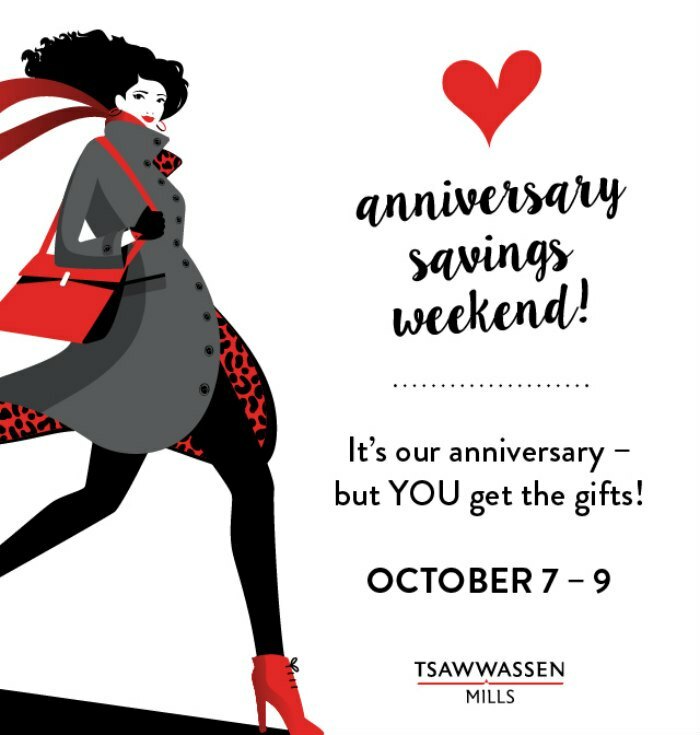 To make it even better, if your birthday falls on October 7, October 8, or October 9, and you’re at least 19 or older, you’re eligible to receive a free Tsawwassen Mills gift card. All you have to do is visit guest services with your valid government issued ID and they’ll surprise you with a birthday gift card. It could have a $20 or even $100 for you to spend! This long weekend is the chance for you to buy more fall fashion for less. 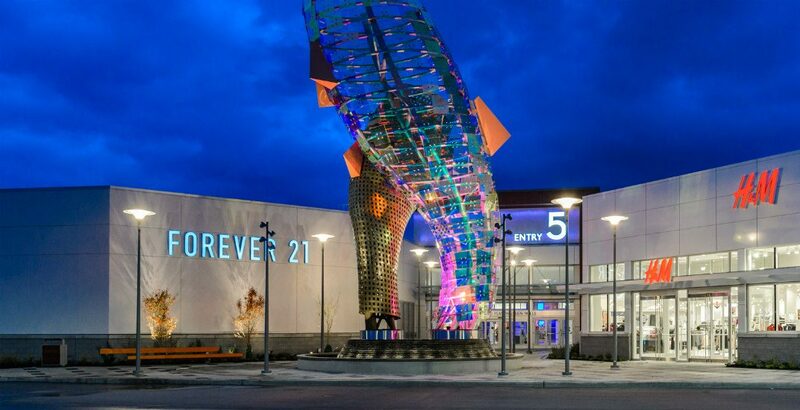 And since Tsawwassen Mills has a perfectly curated mix of premium fashion brands, outlet stores, and first-to-market retailers, it’s the perfect place to pick up wardrobe staples. You’ll easily find exactly what you’re looking for at Victoria Secret, The Outlet by Harry Rosen, Nike Factory Store, Browns Outlet, Old Navy Outlet, the Michael Kors Outlet, and more. Contrary to what you might think, it’s not just all shopping at Tsawwassen Mills. The fashion hub is also home to an indoor kids play area, and a massive indoor skatepark at West 49, plus an aquarium-inspired bowling alley at Uncle Buck’s. So no, you definitely won’t be bored at the mall this long weekend and neither will the kids. Oh, and you can rent strollers with embedded entertainment tables at the mall, too. If you’re driving from downtown Vancouver, getting to the mall will only take you roughly 45 minutes. And with more than 6,000 parking spaces, multiple entrances and exits, it’s good to know that parking will be easy once you get there. There will also be parking aides on hand to assist with ease of parking and leaving. Insider’s tip: use Salish Sea Drive at the west end of the property for easiest access in and out!